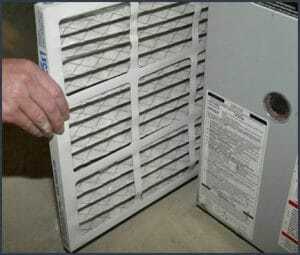 Is a furnace filter the same thing as an air conditioning filter? I just learned my furnace has a filter. How do I change it? If you find yourself asking the same questions, read on to see the answers! The answer to this question is YES if your house or home has central heat and air conditioning. It is also YES if your house or home has a separate cooling (HVAC or AC) unit and heating (furnace) unit as they both typically share the same air-handler. Since the air-handler is the exact area your air filter resides, both systems share the same filter. Air will flow through your air-handler whether you’re cooling your home in the heat of the summer or warming it during the winter months. It is important that the airflow not be constricted or impeded, or strain will be placed on your furnace/AC unit, causing less efficiency and can eventually lead to damage to your unit. In many newer homes and houses and those that are located in climates that only require moderate cooling and heating, a heat pump may be installed which is your AC/heating unit. More efficient than traditional separated AC and furnace systems, the heat pump model uses the same compressor and the same air-handler. So, in this case, the answer to this question is YES once again! Your heating and air conditioning filters are one and the same. During this time of your it is important to remember to replace or change your furnace/AC filter to make sure you continue to be prepared for the cold weather. Also commonly known as whole house air filters, you want your furnace filter to be clean in order for it to continuously provide you and your family with the freshest air possible without issue during the winter months. This question is most often asked by homeowners who don’t have central air conditioning systems. In older homes, especially across the Northern states and sections of the US, many houses do not have a central heating and air conditioning system, rather they have individual wall-mounted AC units (or no air conditioning at all) and a separate furnace. First and foremost, turn the furnace off! Next, find where your filter is housed. It will either be located inside your furnace, or sometimes it is located inside of the air return vent. Before removing, take notice of the little arrow on the filter (before removing) which indicates the direction of the air flow. We recommend taking a non-erasable marker/pen and marking the air flow direction on the outside of your furnace to make sure you always remember the correct way to re-install future furnace filters. You can proceed to remove the existing filter. When removing the old filter, take a look on the frame of the filter for the size. If you happen to find that there is no filter in place, follow these measurement guidelines to make sure you purchase the correct sized filter. Purchase the right filter for your furnace. A quality filter will make sure that dust, pollen, and smoke are removed from the air, plus ensure that you and your family breathe the freshest air possible while your furnace is in use. You are now ready to install your new filter. If covered with a plastic wrapper, be sure to remove the wrapper before installation. Looking for the markings that indicate the airflow direction and simply slide the new filter in place. Close or replace any cover that was previously over it. To make sure you know when it’s time to change the filter again, it’s a good idea to write down the date you changed your filter in your records or even right on the filter itself. Selecting the filters that are just right for your home can be difficult and confusing at times. Although not exactly rocket science, choosing the best furnace filter to replace your old one can be a bit of a challenge. What MERV rating is best for my family? Is there an advantage to getting a higher-rated filter? Am I paying the right price? At US Home Filter we understand this, which is why we offer an experienced staff to help answer any questions you may have. If you have any questions about furnace filters (or any other questions about AC, custom air filters, Whole House filters or Grille filters), we have an experienced staff to help answer any questions you may have. For personal assistance with your air filter needs, please contact us now online or call us at (855) 237-1673 and we will do our very best to assist you in selecting the right filter for your individual needs. We carry humidifier filters and pads for all major manufacturers (including Air King, American Standard, Aprilaire, GeneralAire and Honeywell). We want to earn your business and we guarantee your satisfaction! Take advantage of our quality products, vast selection, low prices, and enjoy FREE SHIPPING on every air filter order within the Contiguous USA. © U.S. Home Filter 2019. All rights reserved.